Shubho Nabobarsher antorik shubhechha janai. Shubho Nababorsho Sandeepa to you and your family! Shubho naboborsho Sandeepa to you and your family. Shubho Nabobarsher Subheccha to u and ur Family Sandeepa! Shubho Nababorsho Sandeepa to you and yours. May the new year bring you all lots of peace + fun. I jussst ordered a box of rasogullas from our local Bong sweet shop. Will think of you when we eat them! Shubho Nabo Borshor jonno onek preeti aar shubhecha roilo tomaar poribaarer proti - bachhader jonno onek bhalobasha aar ashirbaad. Happy New Year! Sandeepa. We celebrate Tamil New Year on the same day. Happy New Year and hope u had a wonderful day Sandeepa! Happy New Year Sandeepa. May this new year bring you and your family happiness and joy!! a bong, a mom, a cook and a book! Shubho Navabarsho :) Wishing you and your family a great year ahead!!! 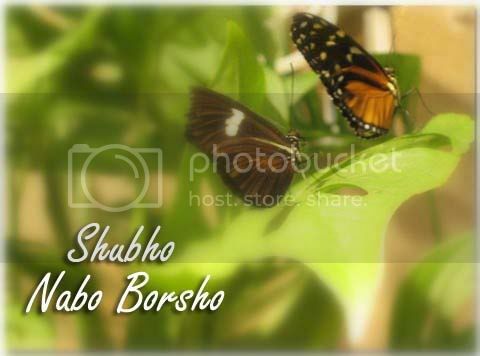 shubh nab barsho ...to you and your lovely family..
As the Bengali year passes onto the next, I laze around in Calcutta first time after 2001. May your new year be filled with happiness and blessings. Wishing you peace and happiness in 2012.